1. So this week I did the right thing and it did me good. I sold my old camera on ebay and the guy I sold it to said it was faulty. I had no idea it had a fault so of course said I'd refund him once I got it back, even though I'd stipulated no refunds. I wasn't sure if he was pulling a fast one but just hoped he wasn't having me over. So I got it back and it turns out it did have a fault unbeknown to me. Anyway in a nutshell I originally bought the camera from Littlewoods and cutting a long story short, because its still under 12 months old I'm getting a full refund for what I originally paid for the camera. Its all about karma people. You reap what you sow! 3. 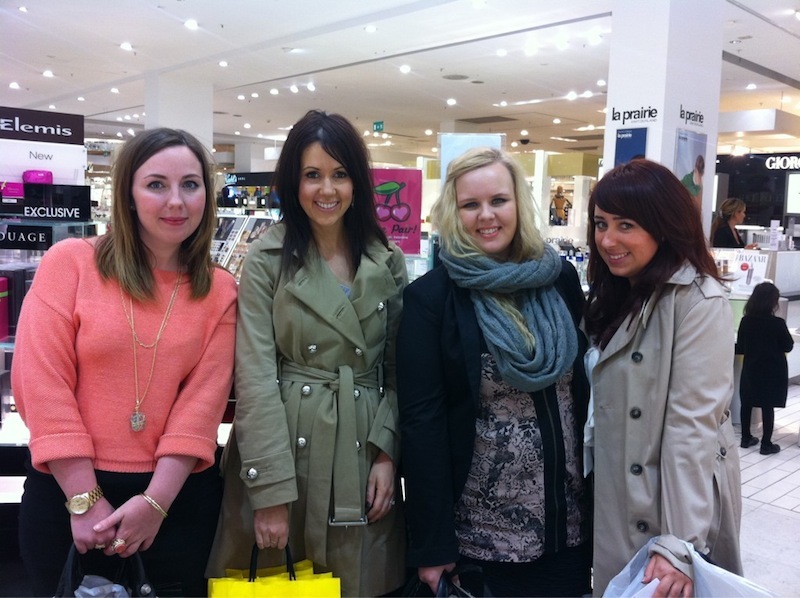 This week I met up with my favourite girls Nicola and Gemma for our monthly mothers meeting at the Trafford Centre. This time Laura ventured up too to join our get together. I was so pleased to finally get to meet her after chatting for so long, I can report that she is completely lovely just as I imagined. Lots of fun was had by all and I can't wait until next time! 4. This week its all about fake tan and red lips. After seeing the photos of me from the meet up I realised the time for pale is over and the time for tan is nigh. So without further ado I quite literally smothered myself in Xen Tan. I actually used a different type of Xen Tan to the one I normally use and I absolutely love it. I prefer it about a million times more than the dark lotion and will definitely be posting a review over the next few days. The only thing I've found is that photographing a tan is rather tricky, trying to get a true reflection of the colour is pretty difficult. You can kind of see the colour in the pic below. Also this week I found the first red lip product I have EVER liked. Seriously. More info to come on this baby this week, so keep your eyes peeled for a full review. Do you think I can pull off the red lips? I hope so because I ventured out of the house with this face today! 5. I did a full page about all of my favourite blogs and websites, so if you've missed that, you can check it out here. I'll keep including my recommendations in my Monday Summary's as of next week. The red lips look lovely Kelly. Think I need to check out this zumba thing! Red lips really suit you, love your hair aswell. Good news on the camera! good karma indeed!! You look really lovely in the bottom photo, red lips really suit you! oh, i love laura. i hope she starts blogging again. I think you can definitely pull of the red lip, it looks stunning. I'm eager to find out what it is... I'm not sure if I dare yet. I glad you suggested Zumba classes... I wanted to try it this week as I found out we have a class quite close to us. But I got scared and didn't go... I'm such a wimp at times. You've spurred me on a bit to give it a go. It just looks so fun. For some reason I'm really into dancing at the moment... I never really have been... been recently I'm obsessed I tell you. I hear a lot about xen tan and zumba, might have to do some research on them both, can't wait for your review on the xen tan. You can definitely pull of the red lips! Love your braid btw!